This is to inform all N-Power Applicants that The N-Power Assessment Tests commences on 1st of July, 2017. All applicants will Received an SMS to write the online assessment test. · The Assessment Test Will Begin with N-Power Tax today and another group of N-TAX applicants will receive Text Messages later today to write their assessment test tomorrow. 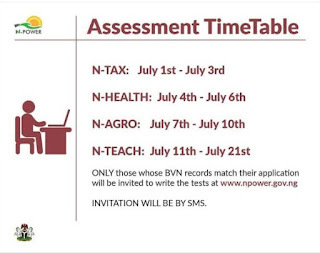 · Only Applicants who applied for N-Power TAX will write their tests between today and Monday, July 3rd. · Only applicants whose BVN records match their applications will write the assessment test. Like us on Facebook for more information on N-power.